Fatcat is open source web application pen tester tool freely available for download. Fatcat SQL injection is developed for reducing the processes of while exploiting SQL injection vulnerability and exploiting SQL injection profoundly. WAF (web application firewall) bypass. To execute this tool please Provide Testing URL, Parameter (vulnerable URL), Max column count, and select injection typ. If you want to bypass WAF select any one of from list. 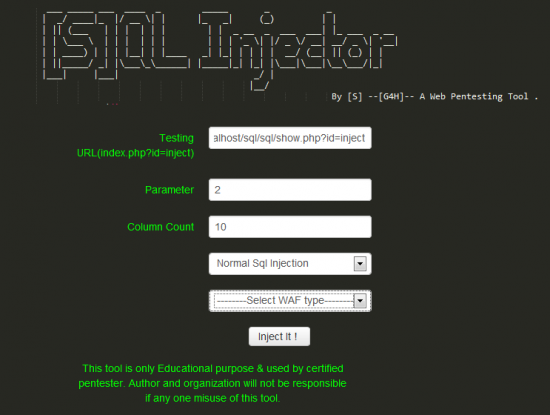 SQL injection is one of the most common vulnerabilities in PHP applications. SQL injection vulnerability requires two failures on the part of the developer – a failure to filter the data as it enters the application and a failure to escape data as it enters the application. After the successful execution of the above query it will delete the table called as clubhack and query is looks like following vaild SQL Statement. For gathering Mysql 5.0 database information Fatcat call the following functions to harvest DB info. *Let’s considered column 2 is vulnerable from where fatcat extract the DB information & data. To find the total number of columns present into table Fatcat using following SQL Statement, where n is total number of columns of table which is present in the column. Fatcat create a valid SQL statement to count the number of present column numbers. Which is looks like following SQL valid SQL Statement. Note: This Operation is located at line number 114 in the dosql.php file. Fatcat is using standard Mysql function to find out current version of Mysql. Note: Finding version operation is located at line number 163 in the dosql.php file. To fetch Mysql current user name of Mysql Fatcat using following function. Note: User () is code is located at line number 174 in the dosql.php file. Note: @@datadir is code is located at line number 182 in the dosql.php file. To finding Base Directory of database, Fatcat using following SQL statement. Note: @@basedir is code is located at line number 189 in the dosql.php file. To finding Host Name, Fatcat using following SQL statement. Note: @@hostname is code is located at line number 203 in the dosql.php file. To finding Operating System version, Fatcat using following SQL statement. Note: @@version_compile_os is code is located at line number 209 in the dosql.php file. To find Max allowed packet size, Fatcat using following SQL statement. Note: @@max_allowed_packet is code is located at line number 196 in the dosql.php file. To finding Current Database name, Fatcat using following SQL function. Note: database() is code is located at line number 159 in the dosql.php file. Normal SQL injection is one of the important features of the Fatcat. Normal SQL injection is combination of Union & Select SQL statement. Union statement helps us to combine two result set of the select statement. Normal SQL injection perfectly works only when any column is vulnerable like as in the above example column 2 is vulnerable. Whenever you inject using Normal SQL injection, Fatcat automatically start selecting vulnerable column & start profoundly exploit it. Enter parameters to execute Normal SQL injection & click Inject It! You will find the normal SQL Injection code from line number 93(file name dosql.php). Error based SQL injection is one of important features of the Fatcat , it is also called as Double Query Injection. Some time Union based injection gets failed, to exploit profoundly in that condition user can use error based SQL injection to retrieve DB information. Double query SQL injection is a vulnerability that uses two queries together wrapped into one that confuses the db to a point where it spits out an error. This error gives us the info we need to leverage the database all the way to the admin panel. As a matter of fact we can pretty much dump the whole database if we want. Now double query definitely utilizes fewer requests that blind SQL does, but there is no group_concat feature(obviously) which means we must use concat with Limit to pull them to pull the info query by query using limit 0,1, limit 1,1, etc. I know you guys are well versed in SQL so I won’t waste any more time on logistics. You will find the normal SQL Injection code from line number 330 (file name dosql.php). According to OWASP, web application firewall (WAF) is an appliance, server plug-in, or filter that applies a set of rules to an HTTP conversation. Generally, these rules cover common attacks such as Cross-site Scripting (XSS) and SQL Injection. By customizing the rules to your application, many attacks can be identified and blocked. The effort to perform this customization can be significant and needs to be maintained as the application is modified. Fatcat V2 supports the following WAF’s. ModSecurity – Also works under Mac OS X, Solaris and other versions of Unix. Fatcat V2 supports the following WAF bypass method. These styles execute MySQL queries in comments. The bold portion is the example of the C-Style Comment WAF bypass. An exploitation technique that alters the flow of an application by overwriting parts of memory. Buffer Overflows are a common cause of malfunctioning software. If the data written into a buffer exceeds its size, adjacent memory space will be corrupted and normally produce a fault. An attacker may be able to utilize a buffer overflow situation to alter an application’s process flow. CRLF (Carriage Return and Line Feed) is a very significant sequence of characters for programmers. Use of CRLF in Mysql to Carriage Return or Line Feed. Normal WAF doesn’t detect the CRLF use in SQL injection. The bold part show the use of the Information_schema.key_column_usage in fatcat. Using following link you can download the latest version of Fatcat.